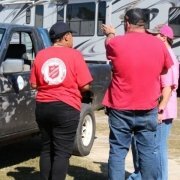 Panama City, FL (November 2, 2018) As the days turn into weeks since Hurricane Michael hit Panama City, The Salvation Army remains steadfast in its efforts to provide comfort and hope. 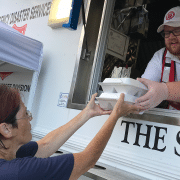 Crews on Salvation Army canteens (mobile feeding units) head out across the city each day to provide hot meals to thousands of survivors, as well as distribute food boxes, hygiene kits, cleaning supplies and tarps. 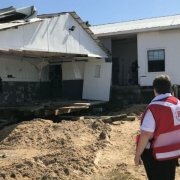 “This is the worst hurricane I’ve ever seen,” said Fred Pentz of Kerrville, Texas, who has been a volunteer with The Salvation Army’s Emergency Disaster Services since 2007. “I was at Harvey last year. Harvey was tough. This is ugly,” he added. The ugly, widespread damage may take months or even years to repair and rebuild. 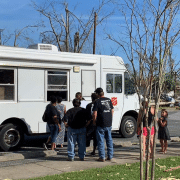 The spirits of the hurricane survivors are starting to lift, though, and they are expressing their gratitude to Salvation Army volunteers in special ways. Fred and his fellow canteen worker took their canteen for an oil change a few days earlier. When they went to settle the bill, the manager told him an employee named Nathan was going to pay for it himself. Fred was speechless. 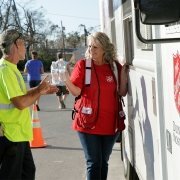 Mitzi Johnson and Carol McKernan had been pulling 12 hour days for almost two weeks, when 7-year old Lillian stopped by their canteen on St. Andrews Boulevard in Panama City. Together with each card was a wooden cross Christmas ornament. Thanks to all of you, those here now and those that have gone home and to those that will still come. Your prayers, giving of self and time, encouragement, smiles mean so much. Also my husband and I are so grateful for the food provided and love felt. “It just hits your heart in a way, to know we are truly blessed. 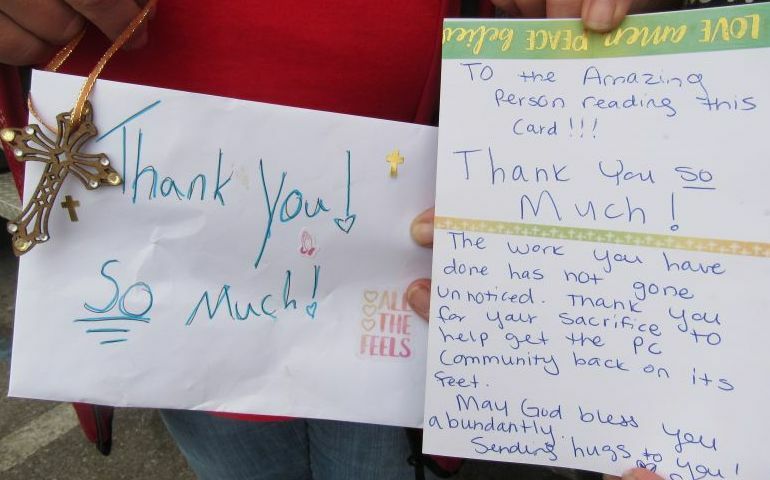 Not only as individuals but as an Army,” Dan shared.